The Forging change is net neutral. Default power of gear has always been inversely proportional to forgability. Special gear was always going to be hard to forge then gem: Wood > Stone > Metal > Gem > Special. This is going to be awesome!!! Now every store won’t be selling the same hammer! Rare items injection into the economy…coming up! Listen, I have over 1200hrs into this game, but have not done much forging other than a few things for myself and my kids. And truthfully, I don’t believe that I should be able to forge these new weapons. In game hours don’t matter. Its true skill that matters here. The devs have been doing a hell of an amazing job keeping the flow of everything going smoothly, all while listening to a bunch of people whine and complain about everything and anything. So what do they do? They tweak the system a little in those peoples favor to help give them a boost. Which is fine, cause every change I’ve been witness to since EA has been for the better. But to me, as a proud parent, this reminds me of being a “lawnmower” parent. You guys/gals who are parents know what that means. 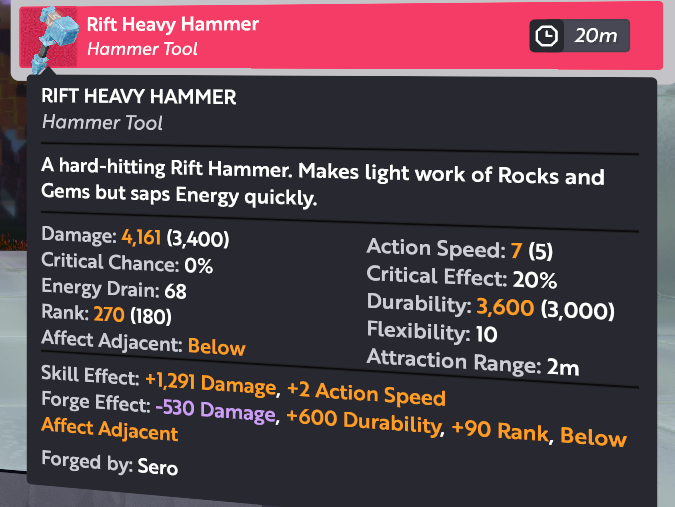 Now, with these items being insanely difficult to forge, is like them finally putting their foot down and saying, “we’ve helped make your lives much much easier in game. Now its time to learn on your own.” So you know what I say to this? Good! I welcome all comments, opinions and will be reading every post in response to this one. Thank you for spending the time reading my senseless novella! You all rock!!! 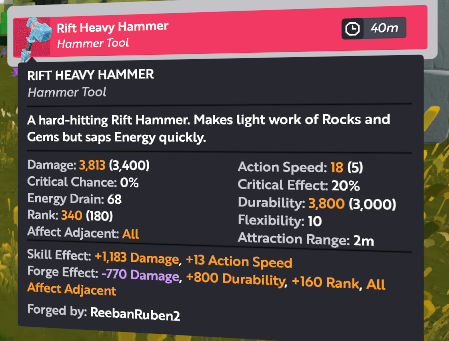 If you compare those two hammers “Rift Heavy Hammer” has way more damage even though I wasn’t able to rank up the damage boon very much because of the 39 percent efficiency. If you look at the durability I am only 400 less durability sitting at 3600. Now, my major issue with my first real shot at forging one of the new pieces is I only got level 2 in AOE and I need lvl 4. However, with some playing around with it I’m sure I can get it to level four. My conclusion is, in the long run, it will be a great addition to forging. I think it will help not everyone have the same tools on their shelves when selling forging materials. 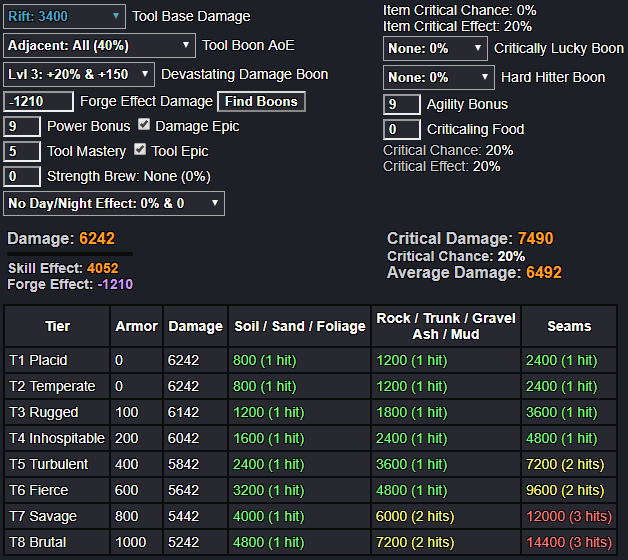 plus look at both item stats, energy drain 38 vs 68, durability 4000 vs 3600, the diamond tool here is way superior here. unless you guys want us to use that cheese method to increment stability and vigor pass the limit i do not see how to forge these item for beeing a bit better than what we can do with gems. unless you remove completely the aoe boon use on the new material tools. That is true gorilla I didn’t take into account the reduction when it goes to cross and 3 by 3… Some things to take into consideration. I’m back on the fence again. Unless a new forging technique comes out I’m not sure they’re going to be worth forging at all. That’s lvl 3 damage I believe. 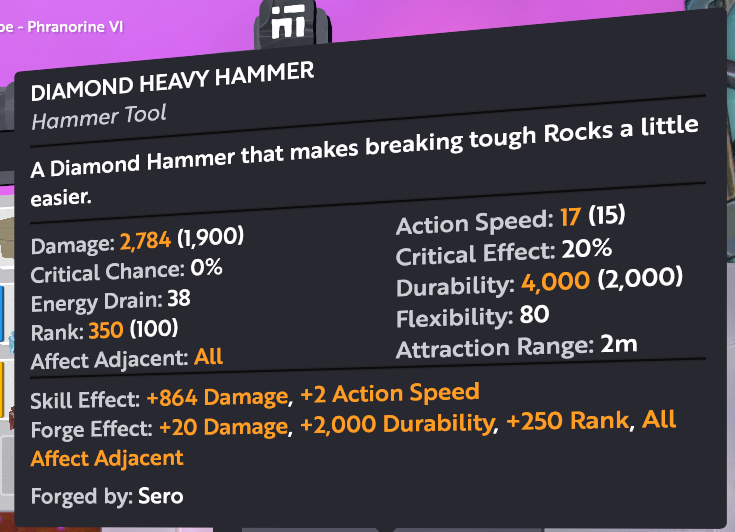 With 3x3 aoe it’ll hit harder than a diamond tool. Damage numbers are 6242 vs 5472 (diamond lvl 8 dmg), but while that might sound a lot, in reality the only hit count difference is in T8 soil/sand/foliage category. 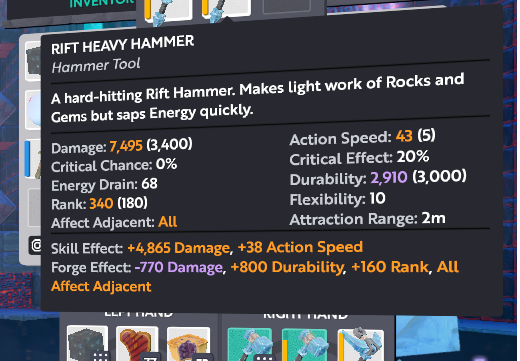 All the other stats (action speed, energy drain and durability) are superior on a diamond tool, so forging these does begin to look a bit pointless, if this is the limit for them. Let’s see if somebody can come up with a new technique for these that would make it surpass the gem tools. Edit i was well over 300 rounds at this point too. I’ve forged wayfarer’s totems to 3x3 aoe and +9 DMG boon before. They have 65% effectiveness when maxed out. It does not seem that hard to make the new items have high damage aoe. We may finally use some of the forge ingredients that have been useless up till now. 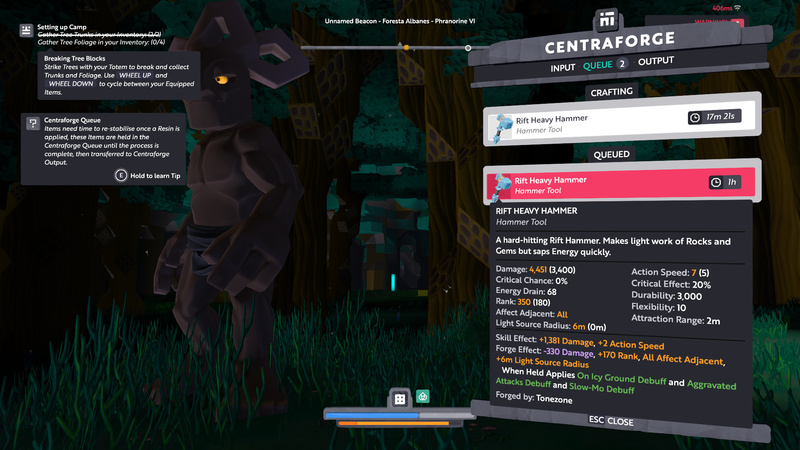 I went on the testing server to try forging these new items. Got aoe and boon damage 7 on my second test. the one i have do not have the new mats in it ?